I was so excited when I came up with my DIY Herbal Bath Confetti tutorial. I mean it’s the easiest DIY ever and it’s such a fun thing to make! Bath confetti is dissolvable paper that you can sprinkle into your bath. Sometimes the bath confetti is bad out of actual soap, sometimes it’s a bit on the package peanut side of things, but most of the time it’s colored dissolvable paper that serves pretty much no purpose other than something fun to put in your bath. 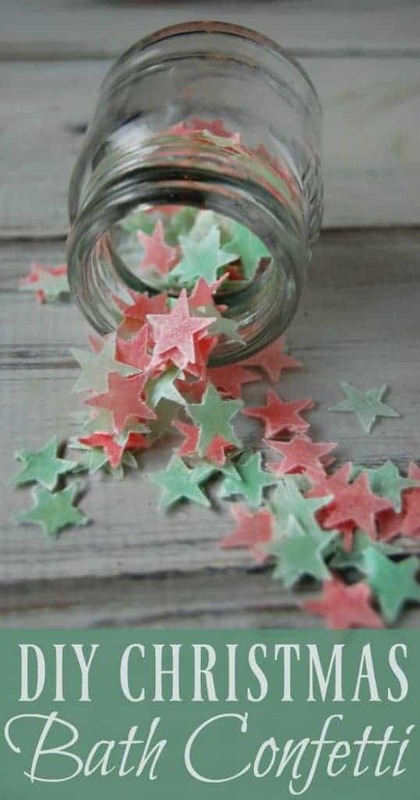 As I mentioned before, there aren’t any DIY versions out there for bath confetti! I don’t know why that is teasing as how it’s the simplest thing to make! 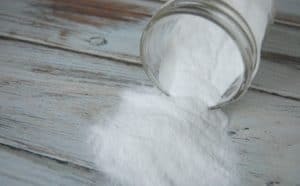 I had already come up with my DIY Herbal Bath Confetti butI knew as I was making it (in late November) that it would make a great holiday gift which meant, I quickly brought out my supplies and started making these DIY Christmas Bath Confetti. It was the only logical thing to do! 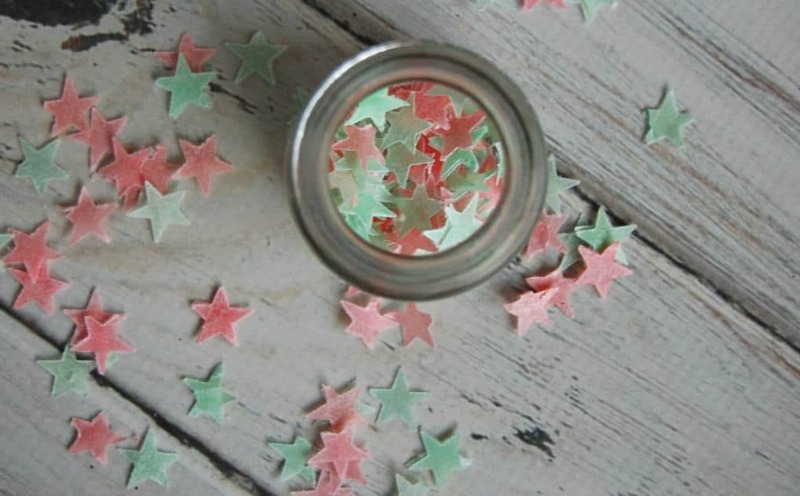 Like I mentioned, DIY bath confetti is very easy to make. All you really need is paper (the dissolvable paper kind), soap, and natural dye (this version uses pre-made natural dyes but if you want to dye with herbs then check out my herbal bath confetti!). You “paint” the paper, let dry, and then punch out fun holiday shapes! I used stars because that was the hole punch I had on hand but you could do Christmas trees, snowflakes, gingerbread men, etc. This is such an easy and affordable gift to make. You’ll want to make it for the kids’ stocking stuffers, for all your bath fanatic friends… the mail man… okay maybe not the mail man. Seriously though, who wouldn’t love bath confetti for Christmas. Not to mention bath confetti that is free from artificial dyes and fake fragrances! 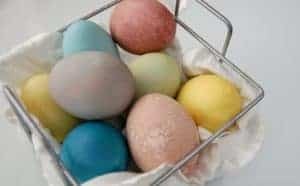 In small bowls, mix a couple tablespoons of liquid castile soap with a drop or two of natural dye. I like to cut sheets into smaller pieces so that I can do a few colors without making a ton of one confetti color. 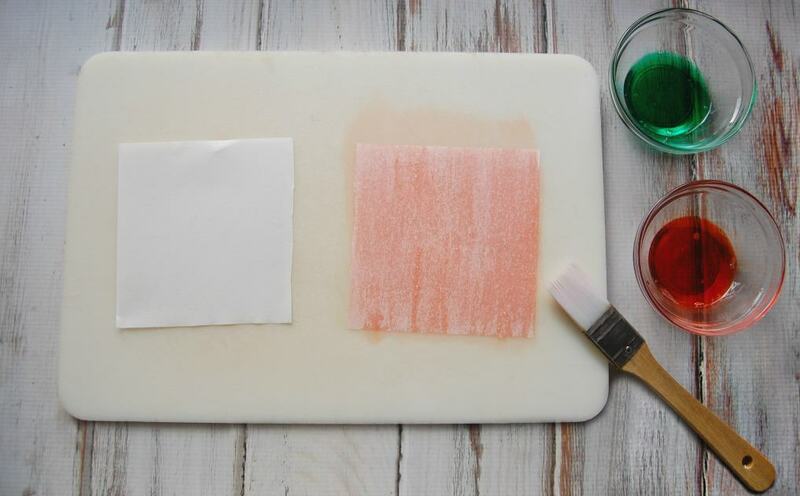 Paint your paper sheets with the dyed soap. Paint both sides. You only need a thin coat. Place the soap paper onto a cooling rack to dry. It will take a few hours before it’s fully dry. 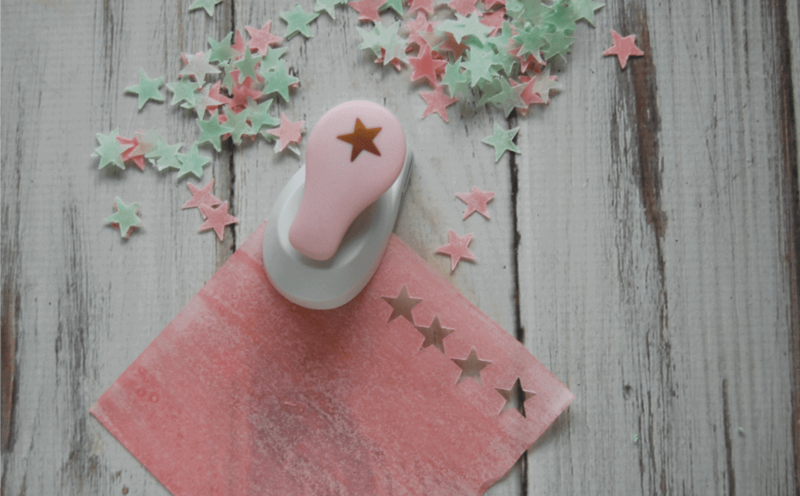 Once dry, use your hole punch of choice to cut out paper confetti. 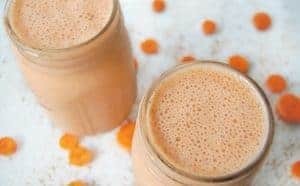 Store in a jar and you are done! Want more great holiday DIY ideas?